« EMC Ionix UIM/P: UCS Discovery Failed. Replace expired UCS certificate. By default certificates are tied to the exact server name they are created for. Which is normally the FQDN of the server. 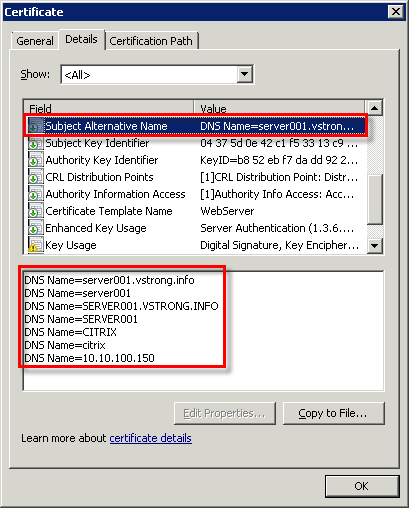 If you create a certificate for the server myserver.vstrong.info and then connect to it by the short name myserver / MyServer or by any other DNS aliases, the certificate will not be seen as a trusted certificate. There is a way to get all aliases included in the certificate. In order to create a certificate you need an application that can generate certificate request and then send it to the Certification Authority (CA) for signing. I will be installing OpenSSL on 64-bit OS, so lets download Win64 OpenSSL v1.0.1e Light and its pre-requisite Microsoft Visual C++ 2008 Redistributible (x64). Installation is straightforward, accept the defaults and select Copy OpenSSL DLLs to The OpenSSL binaries (/bin) directory. Please donate generously! 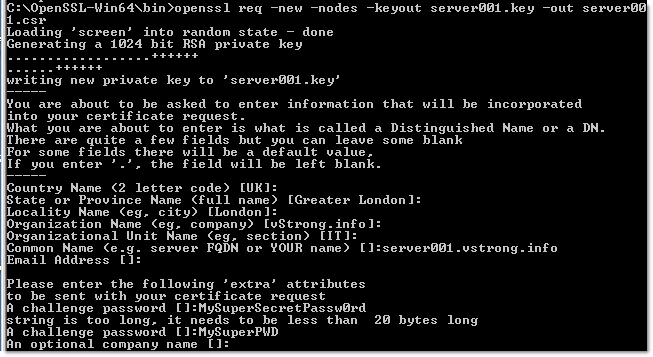 As you can see, I added lower- and uppercase, short and FQDN server name, two aliases, ‘CITRIX’ and ‘citrix’. You can also add an IP address of the server or device. I find it quite useful as sometimes IP address is easier to remember. Lets generate the certificate request! There will be a series of questions. Answer each question and make note of the challenge password; it will be needed later in the process. You must sign the request with Microsoft Active Directory Certificate Services. Open server001.csr with Wordpad (to preserve the formatting) and copy the contents onto the clipboard (Edit > Select all; Edit > Copy). In Internet Explorer, navigate to the Microsoft CA server. The Certificate Services applet starts. On the Welcome screen, below the Select a task heading, select Request a certificate. 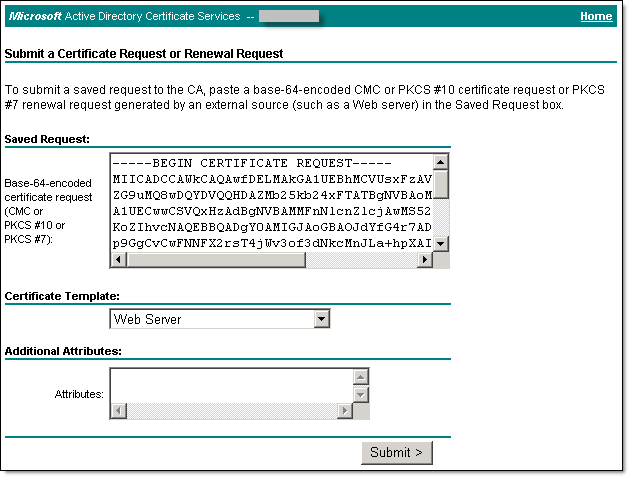 On the Advanced Certificate Request screen, select Submit a certificate request by using a base-64-encoded CMC. The Submit a Certificate Request or Renewal Request screen displays. On the Submit a Certificate Request or Renewal Request screen, paste the content of the server001.csr file (previously placed on the clipboard), in the Certificate Template drop down window select Web Server or other appropriate to your needs template and click Submit. The certificate is issued and the Certificate Issued screen displays. Select the Base 64 encoded radio button and then select Download certificate. Save the certificate as server001.cer to your desktop. Hi, if I want to do this, do I also need to create extra DNS records using the shortname and the same IP address as I used for my original FQDN DNS entry for the appliance?